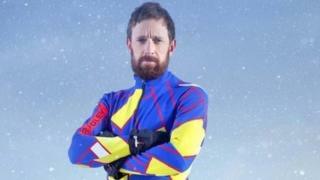 Five-time Olympic champion Sir Bradley Wiggins has quit TV winter sports show The Jump after breaking his leg. The former Tour de France winner said he was "gutted" after sustaining a "small leg fracture" while taking part in snowcross training. Channel 4 said Sir Bradley had been keen to continue but would not appear after the fourth show in the series. Last year, injuries to a number of celebrities prompted a review of safety procedures on the reality show. Sir Bradley, who announced his retirement from cycling in December, tweeted: "Gutted to be leaving The Jump. I wanted to give you an injury update. "Seen a specialist, I have a small leg fracture and need to rest for 3-6 weeks. Good news no surgery or cast required. "Huge thanks to the crew and good luck to all of the cast. Due to the way the show is filmed, I'll still be on until show four, so tune in. "No horror smash, small training injury which means I can't compete. No terrible break, no cast, just need to rest it." The 36-year-old is Britain's most decorated Olympian with eight medals - five of them gold - and won the Tour de France in 2012. Before his departure, model Vogue Williams left this season of the show after suffering a knee injury in training. Last year's series of The Jump was dogged by injuries, which resulted in seven celebrities quitting the programme. They included former Olympic gymnast Beth Tweddle and actress Tina Hobley. Tweddle required neck surgery after a crash last February, while Hobley is still recovering from leg and arm injuries. Other casualties have included Olympians swimmer Rebecca Adlington, Sir Steve Redgrave and Linford Christie.